Colour, the landscape practice, developed Dr Roger Ulrich’s globally replicated evidence that patients with green views recover faster than those without, require less strong drugs, less frequently and that perceptions of treatment improve. Stress could also be reduced through interaction with nature, and staff retention improved. The practice created departmental-specific models and also applied them to car parking, arrival and circulation areas to set the hospital experience and combined them with smooth functionality to minimise stress. It liaised closely with clinicians and set out; inside-outside experiences that brought nature deep indoors; strategic green movement routes including covered walkways; gardens for break out, contemplation and recreation for patients, staff, friends and families; green views for people spending long periods of time in wards, dialysis and oncology. North Staffordshire NHS Trust (now called University Hospital of North Midlands NHS Trust) sought a new masterplan for the City General campus that consolidated two existing hospitals, incorporated new medical buildings to replace old; clear and accessible vehicle and pedestrian circulation and 2000 car parking spaces within a landscape setting. 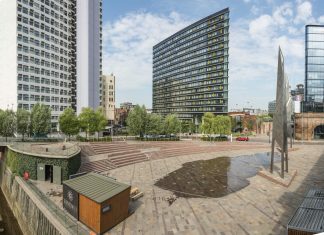 Colour was brought into the design process as a ‘differentiator’ for the redevelopment of the £440 million masterplan, completing a bid-winning team. 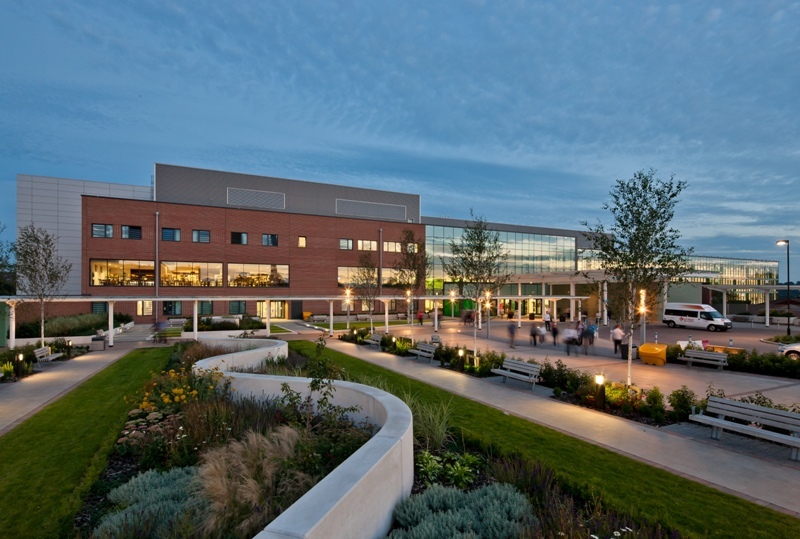 The scope was re-organisation of the 24 hectare campus based around three principal spaces with Colour leading the development and design of the landscape strategy and masterplan coordination – a highly complex role given the multiple phases of demolition, construction, evolution of the brief and the requirement to keep the hospital operational at all times. All services were followed through to detail design and construction supervision on site. The requirements were highly complex, utilitarian and in competitive context. Our philosophy and intention was simple – to connect patients with nature through integrating landscape, architecture and circulation. Colour developed Dr Roger Ulrich’s globally replicated evidence that patients with green views recover faster than those without, require less strong drugs, less frequently and perceptions of treatment improve. Stress could also be reduced through interaction with nature, and staff retention improved. We created departmental specific models and applied to car parking, welcoming arrival and circulation that set the hospital experience and combined with smooth functionality to minimise stress. Formal, incorporating listed buildings, protected trees and leading to an understated but clear Inpatients’ arrival. - Outpatients’ entrance (7,000+ users / day). A welcome to provide confidence of precision comforted by nature. The contemporary contemplation garden is set in the sun. Planting has strong seasonal interest, scent and colour. Lighting makes the space inviting and safe during darkness. Gardens are aligned to provide views out from the 2nd floor restaurant. The cross piece of π is a continuous inside-outside green spine across the site. It connects In- and Out-patients, a bus stop on the A34, accessible or visible gardens associated with internal glazed gallery circulation and a covered walkway to parking zones to the north. Colour delivered all work stages from inception to completion, regularly engaged with the Trust and practitioners, gained agreements and crucially became ‘custodians of the masterplan’. This safeguarded delivery of the external landscape through coordinating engineering and contractors during 274 phases over 10+ years. The Trust steered on functionality. Contractor and QS advised on costs. Colour managed the landscape budget accordingly.